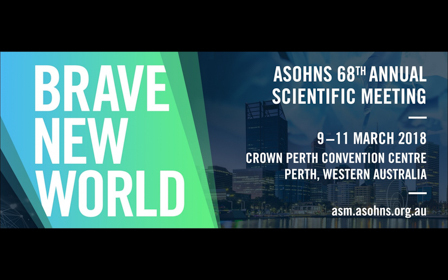 We warmly welcome you to attend the 68th ASOHNS Annual Scientific Meeting. Registrations are now open. The organising committee have finalised a list of eminent international speakers and we are delighted to invite you to Perth for this meeting. The Australian surgical community is addressing challenges relating to behaviour and culture. There have also been exciting developments within our specialty that reflect our desire for continuing improvement and application of innovation to the benefit of our patients. All this is reflected in the theme of our meeting: “Brave New World”. We hope you will be able to attend the meeting and perhaps extend your stay for a holiday to visit some fascinating and beautiful areas in the Western Australia state. At that time of year, the early autumn weather will be balmy and pleasant. We look forward to welcoming you to Perth.